For the longest time I was receiving daily Word of the Day emails from Dictionary.com. Then they stopped. It's one of those things—I was getting it for so long, usually casually glancing at the word then deleting the email, that I never really did anything when the emails started not arriving. I figured a system glitch or something. I finally got around to looking into what's up and discovered that while my email address was still subscribed, I still wasn't getting the emails. Nothing in the spam folder, either. I tried re-subscribing, but it said I was already subscribed. OK. Unsubscribe. Subscribe again. Wait for confirmation email. Nada. OK, I'm done. Finding another Word of the Day service was as easy as a Google search. Wordnik, whose API I had once looked at for an unrelated project, caught my eye immediately. Their Word of the Day service requires you to sign up for an account. I did. Now, I'm once again receiving Word of the Day emails on a (surprise) daily basis. The word is big and hard to miss. Definitions are clear. The "Notes" section gives you a little bit of additional information about the word; basically stuff that falls outside of the definition itself. There are examples that use the word so you can see it in action and, in this case, a user contributed sound bite of the word's pronunciation. 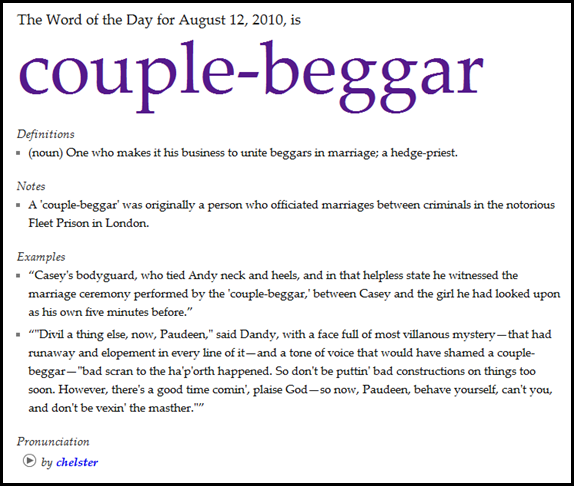 If you're into this sort of thing, I recommend Wordnik's Word of the Day service. I'm also going to start using Wordnik as the definition source for my Interesting Words posts.